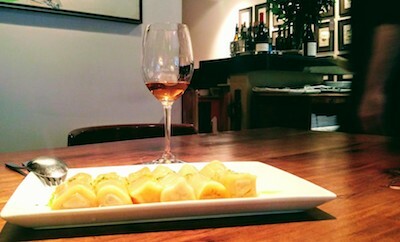 Located in a discreet locale in Barrio de Las Letras in Madrid, Vinoteca Moratín brings to mind those small and cosy Parisian bistrots that invite passers-by to step inside and enjoy a quiet meal. 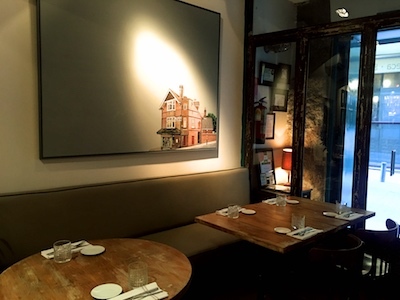 Once inside, Vinoteca Moratín mirrors the impressions from the outside, with a dozen bare wooden tables with no tablecloths, subdued lighting, shelves full of books and paintings on the wall that add natural warmth. The discreet jazz sounds on the background round off the calm atmosphere of this restaurant, which is perfect for couples. Marcos Gil is the owner of this eatery, opened at the end of 2012. Helped by a total grand staff of two -one in the kitchen and one in the dining area- Gil personally takes care of buying all the ingredients and the mise en place. When diners sit at the table, he takes on the role of accomplished host, giving detailed explanations of all the dishes and wines on the menu and taking the orders. The dozen dishes on the menu can all work as starters or mains and can be shared. There’s a daily soup and fish which change according to what’s available in the market and a set of seemingly uncomplicated creations made with good quality produce. 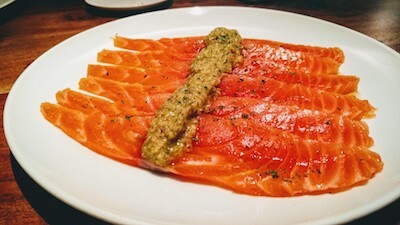 During our visit, Amaya and I shared a finely flavoured leek confit with romesco sauce (€12), a tender dish of artichoke hearts, a delicious home-marinated salmon with pickled vegetables (€15) and a tasty veal cheek cannelloni (€18). 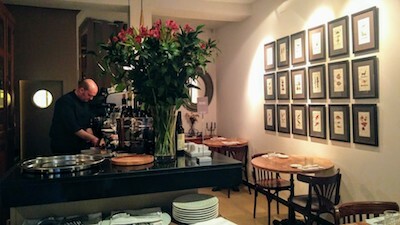 The house’s traditional steak tartare, which Gil cuts with a knife and seasons to suit diners’ tastes, is another favorite of this Madrileño restaurant. 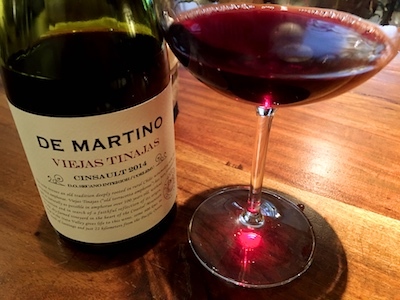 The wine list features around 80 wines, mostly from small and medium-sized producers from Spain, and international wine producing countries like France, Germany or Chile with moderate prices that never go beyond €40. There are around 20 selections by the glass too. Gil stocks no more than a couple of bottles of each wine because he is lucky to have his provider -Vinoteca Trigo, just around the corner- delivering twice a day. The wine service, with Riedel and Schott glasses, is just as polished as the food, which is served on modest white crockery, in tune with the style of the restaurant, which offers quality, understated dishes. Y.O.A.